A brand-new product line of RNK Distributing! ALL inspired by the First Lady of Crafting Fun and Embellishing, Hope Yoder! Hope has been working with RNK’s stabilizer innovator Kay Brooks on developing the full line of Embellish™ products. 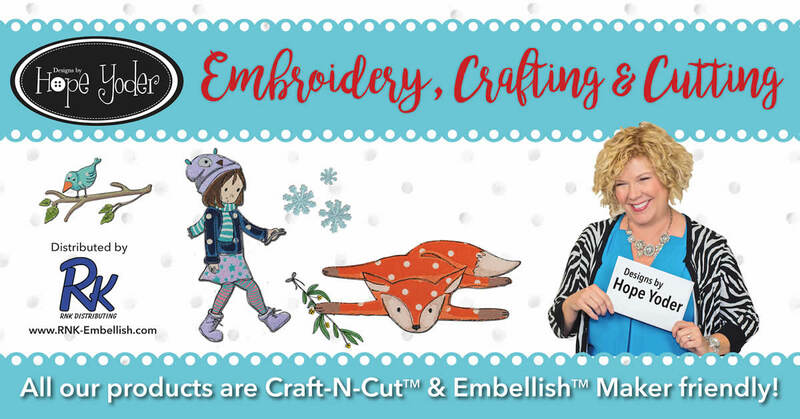 And like RNK’s Floriani, RNK’s Jenny Haskins, and Alex Anderson’s QuiltersSelect brands, Embellish™ is distributed exclusively by RNK, so we are happy to announce all our event formats are available for the new Embellish™ products, inspired by Hope! From Lecture/Demonstrations to multiple day Hands On events, Hope and RNK will have classes for every kind of embroiderer, new or old. See for Yourself About Embellish Events!